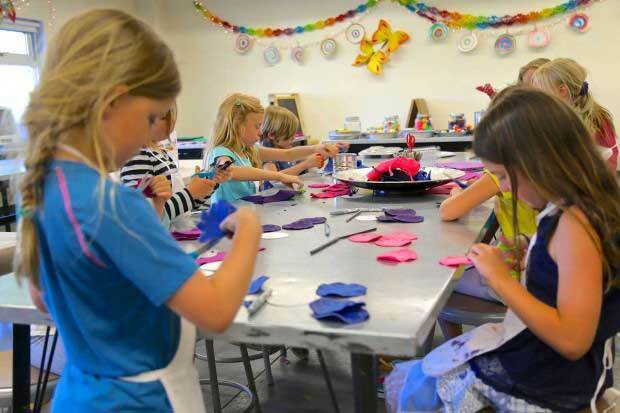 Excited to share with you our art studio, the place where we make and create! Most often we are featuring DIY projects that we’ve created within our School Year + Summer ~hands on + mixed media~ Art Workshops with children. 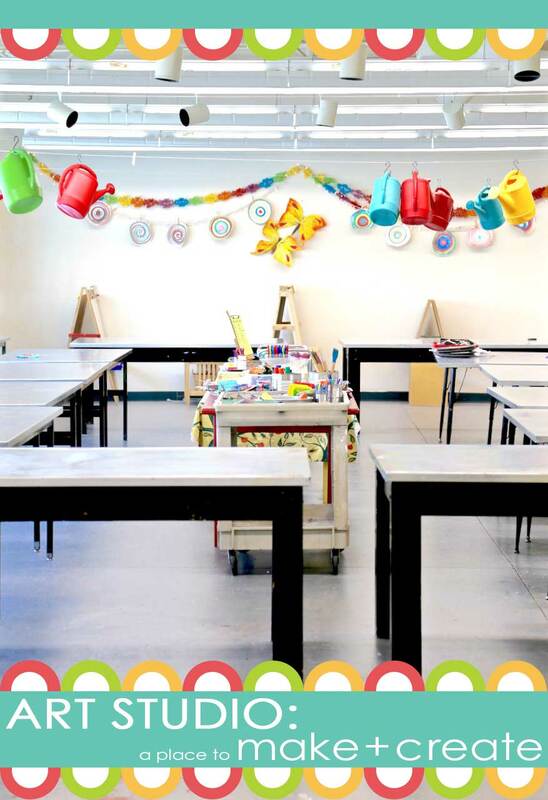 A few weeks ago, my superstar-art-friend Meri Cherry (yes, that’s her really name…don’t you just love it), over at Meri Cherry Blog mentioned that she was thinking about creating an artful roundup, featuring art studios + creative spaces! Honored that she invited us to join in! 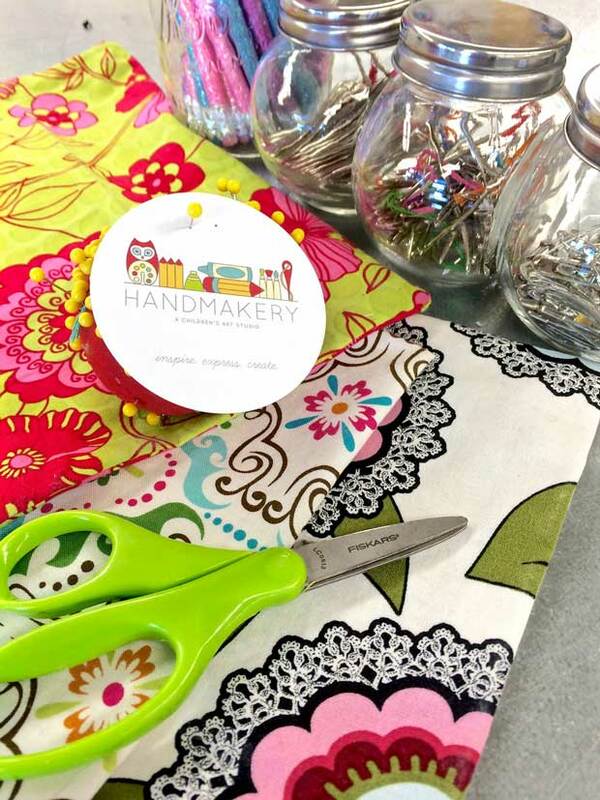 As some of you know, HANDMAKERY was recently invited to join a group of 20 international bloggers focused on creating art with children, the Rockin’ Art Moms! It has been amazing and truly inspiring to connect with this fabulous group of women! We’re so excited that you’ll get a chance to not only peek into our studio, but you’ll also get to say h-e-l-l-o and peek into the studios + creative spaces of some of our favorite Rockin’ Art Moms! Enjoy the tour! 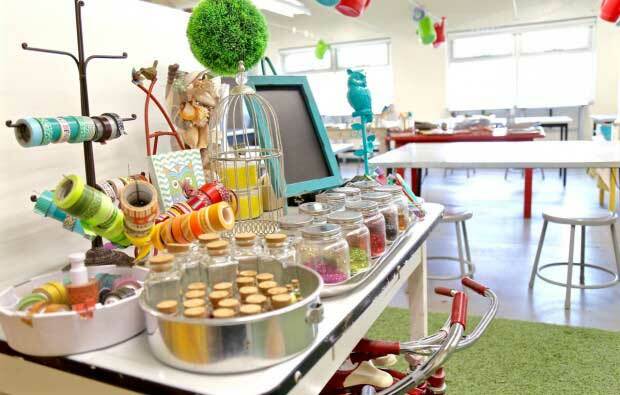 We love creative spaces! You may have seen our collection, CREATIVE SPACES on Pinterest? 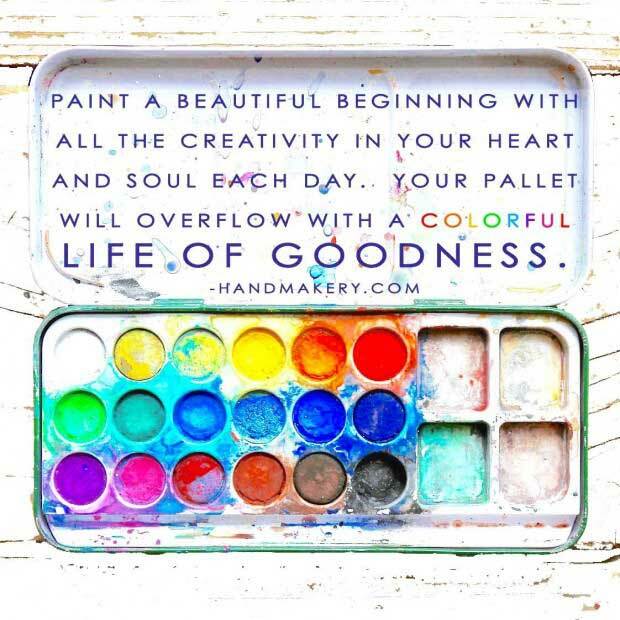 If not, it’s truly a great place to get inspired for creating your very own space to create! In our studio we love to organize supplies in many ways, often using an assortment of glass jars, tin cans, metal dishes, baskets and various containers. 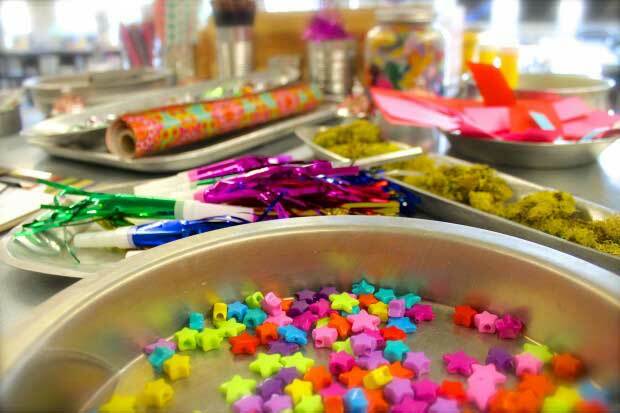 Here’s a peek at our washi tape, glitter and sparkle jar collection! This is a handmade sign we crafted using canvas, masking tape and spray paint for one of our many outdoor art studio events! Not only do we create art within an indoor studio, we often create in an outdoor studio for special events and community happenings. You can take a peek at some of our favorite outdoor studio events- Family Block Party, First Fridays, Octoberfest and Downtown Celebrations! In our studio, we have a large area where creative seeds have sprouted, really! It makes a fabulous “picnic-on-the-greens” to meet with our artists. 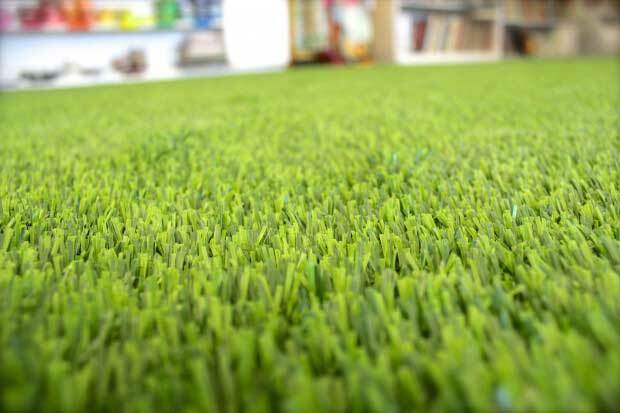 Children love the texture, plus it can easily be washed with a garden hose! In a few of our photos below, you’ll see our multi-colored watering cans that hang high above. 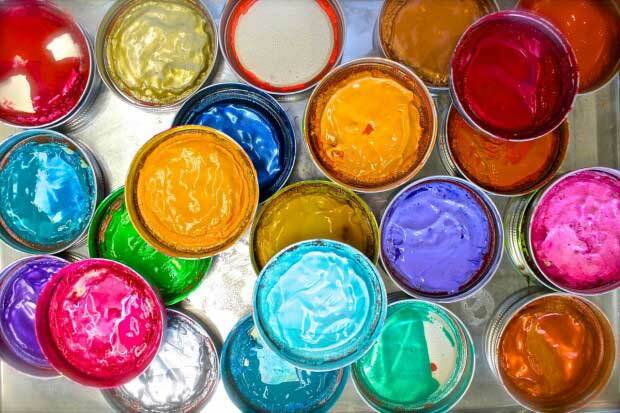 These are used to sprinkle all our artists with a “splash of creativity” and they add fabulous color to compliment! When we discovered these watering cans, it was pretty much LOVE at first sight, as they are the exact colors in our logo design. Sometime you just get lucky in color and quantity! 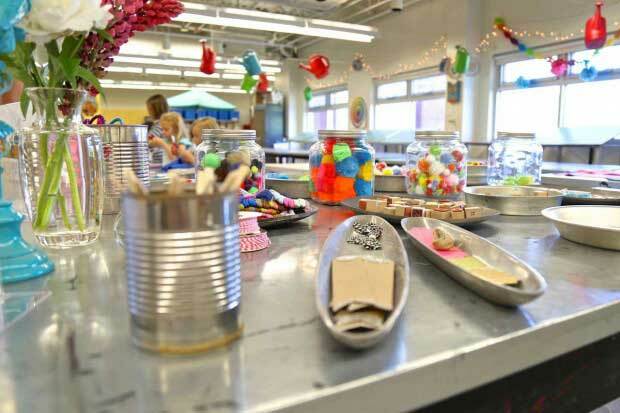 In our studio we believe that when you bring-to-the-table a beautiful and well organized space for children to create, it naturally creates a sense of order to the chaos of creating. Children easily know where supplies and materials are located, and they know where supplies can be easily returned. 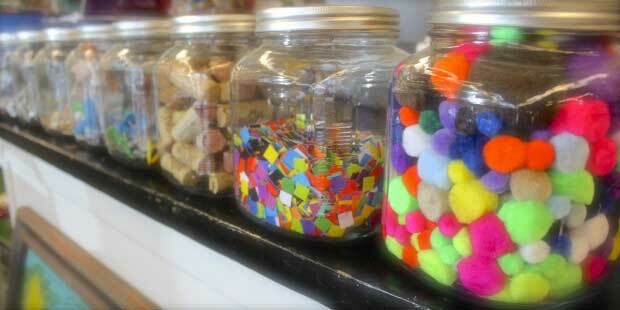 Everything is visible and accessible, many supplies in transparent glass jars. We’re big believers in glass verses plastic, really a conversation for a later date! 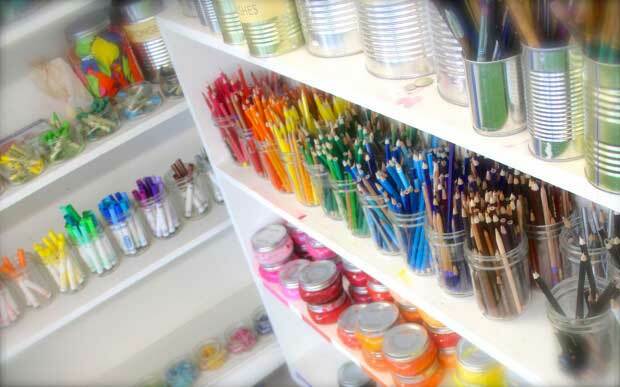 When art supplies are visible and easy to locate, they truly inspire and get used. Having art materials visible, lends itself to a natural decor for an art studio. This is a cabinet we found treasure hunting on a Saturday afternoon, instantly we knew it was a perfect addition to the studio. 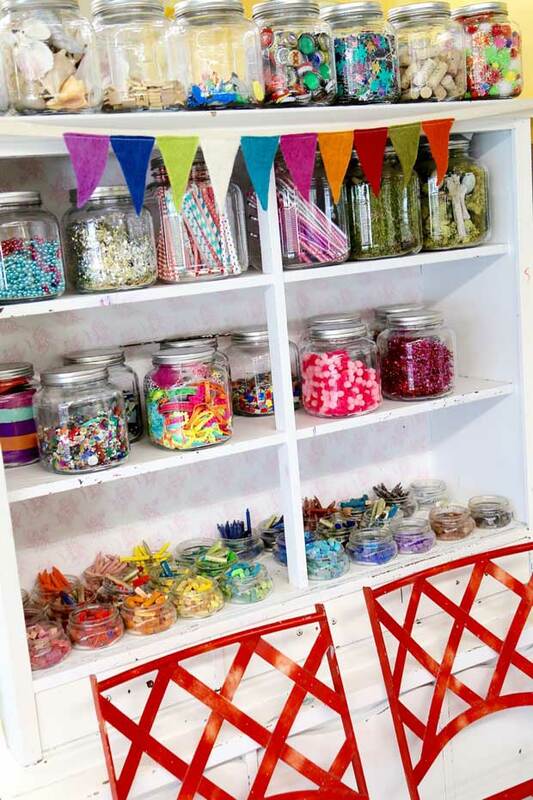 This cabinet gives the studio a colorful and creative “candy shop” feel when you enter in! Along with jars, you’ll also see many large silver cans for additional supplies. We love to use tin cans in a wide array of sizes for housing supplies. They just fit in with our tables, stools and our overall style, plus they’re upcycled goods which we also love! This washi tape holder was originally a jewelry rack. One day we realized it would be so much more useful to house all our favorite washi tapes, waalaa! 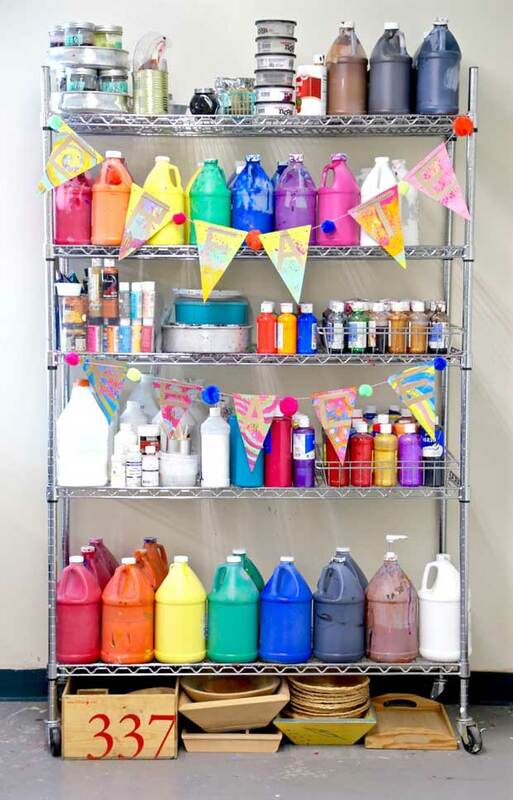 We love to discover new art supplies and exciting ways to organize over on Pinterest, do take a peek at our boards for both art supplies and organization! An art studio is always a work in progress. There are always so many ongoing ideas to organize, introduce, discover, fine-tune and improve, guess this is what keeps life and learning exciting! 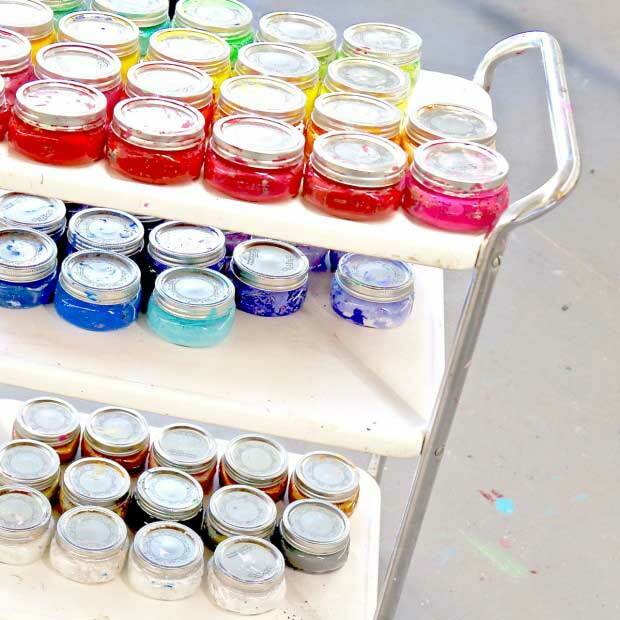 We have a couple locations for our paint jars, but this is our most recent, a paint-cart-on-wheels! We were gifted this vintage enamel cart from a friend and it’s been a fabulous addition! We organized our colors by warms on top, cools in the middle and neutrals on the bottom! When there’s a studio full of artists on-the-move, interacting with a variety of materials and supplies, consumed in the creative process, they don’t have to stop and think about where something goes. With a well-organized studio, the artist just naturally knows where things go, due to the visual organization and consistent location. This is the shelf that all larger bottled paints, including acrylics, liquid watercolors, temperas and various glues are stored. 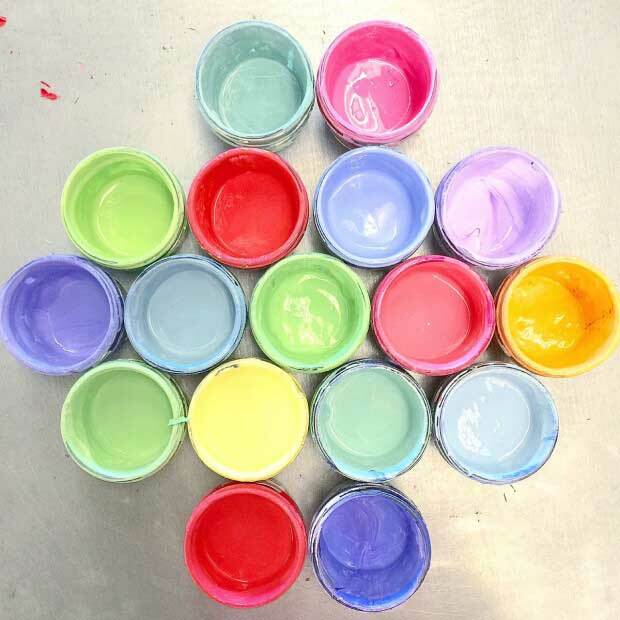 We love organizing color using the color spectrum to create order and beauty. We like to believe everything has an order and a place, so the studio can flow and naturally run itself …at least somedays! 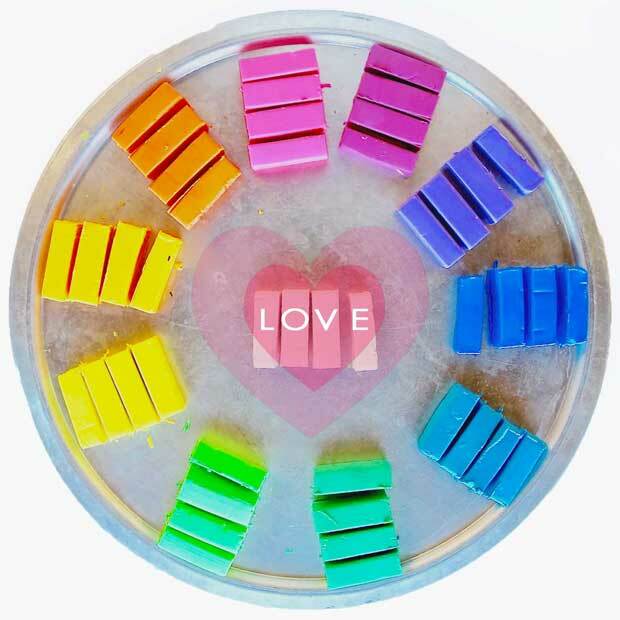 Even polymer clay can be beautifully cut and organize! 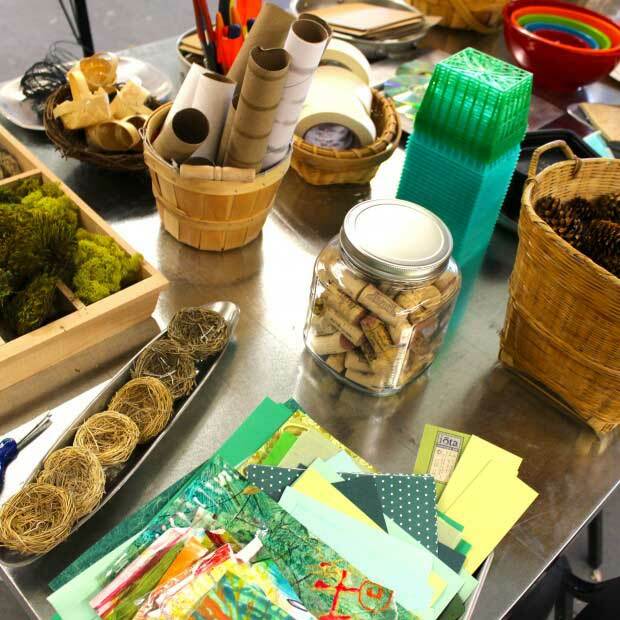 When materials and supplies are displayed beautifully and thoughtfully organized, children gravitate with natural curiosity and interest in exploration. Children also show a great deal of pride, care and respect for supplies and materials that are well organized and thoughtfully displayed. 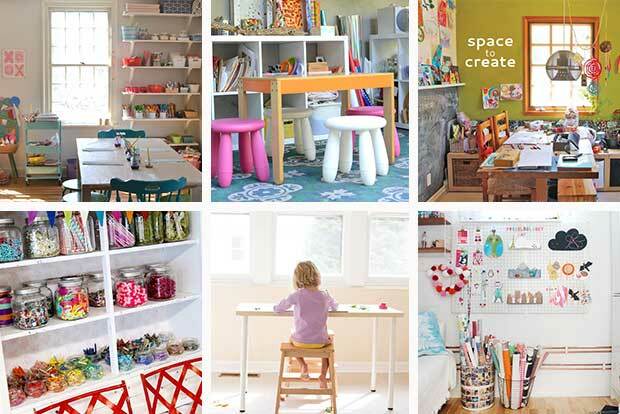 Children are miraculous mini makers and love when their spaces are beautiful, organized and defined so they can create freely! Natural lighting is always a key element, maybe our most favorite element. We are very thankful to have a great amount of natural light to create a bright and cheerful space! 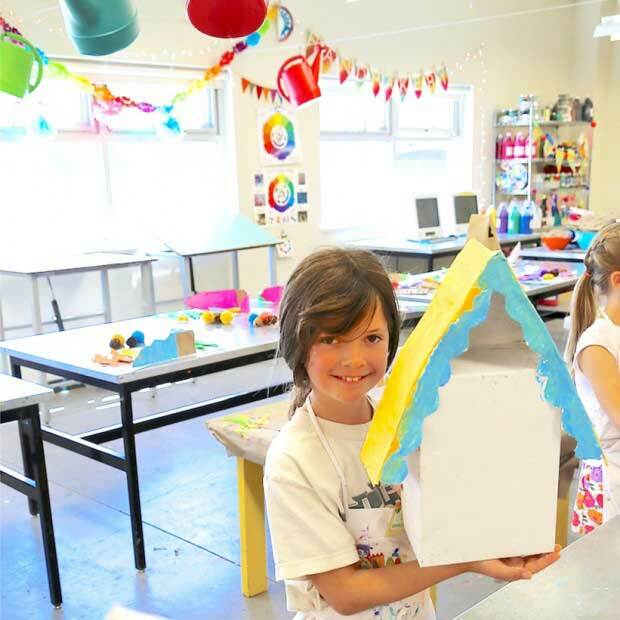 Cuckoo Clock construction was in full-swing in our summer workshop above! Excited to share that we were just invited by Anderson Ranch Art Center in Snowmass, Colorado to create our Cuckoo Clocks the week of Anderson Ranch Art Center’s 50th Anniversary in Summer 2016! You may have seen the amazing design that was selected for the cover of the Aspen Magazine’s Holiday 2015/16 issue to spread the word on the Ranch’s 50 year milestone, isn’t the design beautiful!?! 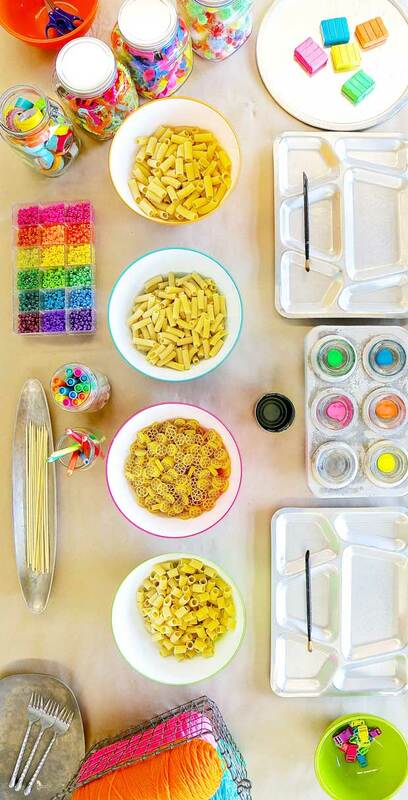 A peek at the studio setup for our DIY Modern Macaroni Masterpiece which was part of #themacaronichallenge with all the Rockin’ Art Moms! 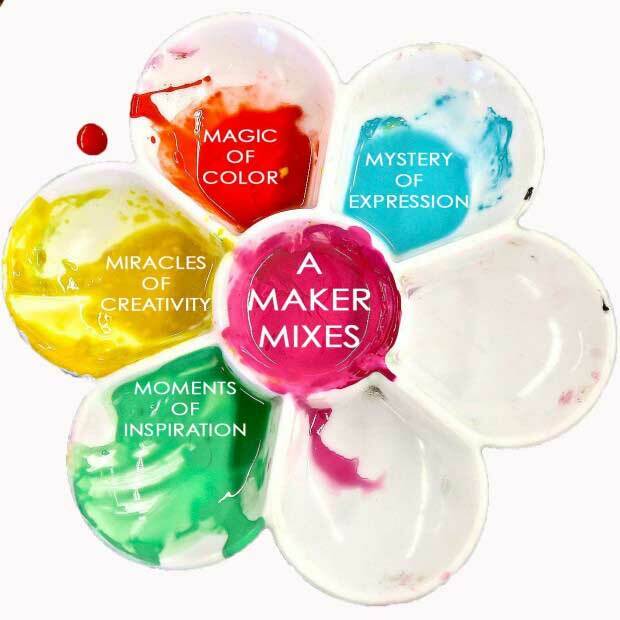 Young artists love to mix their own colors and it’s such a great way to explore. 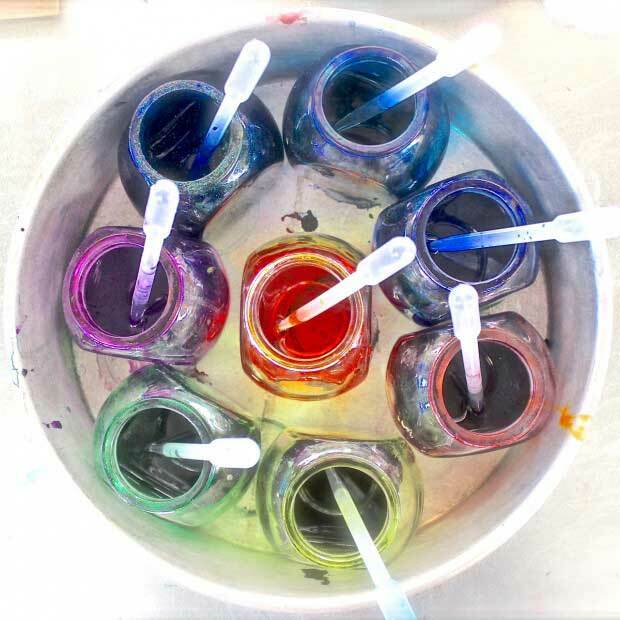 Here we were mixing beautiful tints for our Camper Vans On Canvas! Along with natural light, we also love using white lights to add a beautiful ambiance! You can never have enough white lights to add twinkle, and of course a bit of magic, miracles and sense of wonder! Our studio also has an overall industrial feel with a high, open, exposed, lofted ceiling, which we love as it creates openness! We love to use silvery metal pans, trays and dishes to display and organize. Artists of all ages love to treasure hunt and make their own discoveries. Having goods organized, just makes set-up and clean-up flow easily, plus it keeps the artist captivated with freedom-of-choice. Interested in more behind-the-scenes + handmade goodness + creative process + daily inspiration? Be sure to join us on Instagram! There is an AMAZING network of creatives that fill your day with inspiration + creativity + visual bliss! It’s truly such a fun and exciting place to connect! If you’re on Instagram stop by and say h-e-l-l-o! IF you’re not, it’s super easy to join and you’ll be so thankful you did! Find us, we’re @handmakery! Our worktables are all re-furbished tables that have been covered in galvanized “silvery” metal. This surface has been a fabulous addition in unifying our studio. Love how they are a neutral color to set-off any color, pattern or texture we are creating with! Our metal stools were a recent addition, just love them, just wish we’d gotten them sooner! They’re the perfect height for all ages- child to adult, easy to transport, lightweight and stackable. They flow with our metallic pallet, yet can easily be pushed under the table to allow an artist to stretch out and stand while creating. In our studio we love to hand-stitch and hope to introduce actual sewing machines with time. Learning to sew is something you’ll never forget and something that you’ll always use! It’s such a great accomplishment for children and it really builds self-confidence. Once a child learns the basics, they quickly discover that anything is possible, and that they have the tools and knowledge to make anything they can visualize or imagine. This spring we’ll once again be offering our STITCH + SEW workshop! A studio can never have enough varieties of tape! Tapes today are out-of-this-world amazing, washi, masking and duct tape, just all of it! 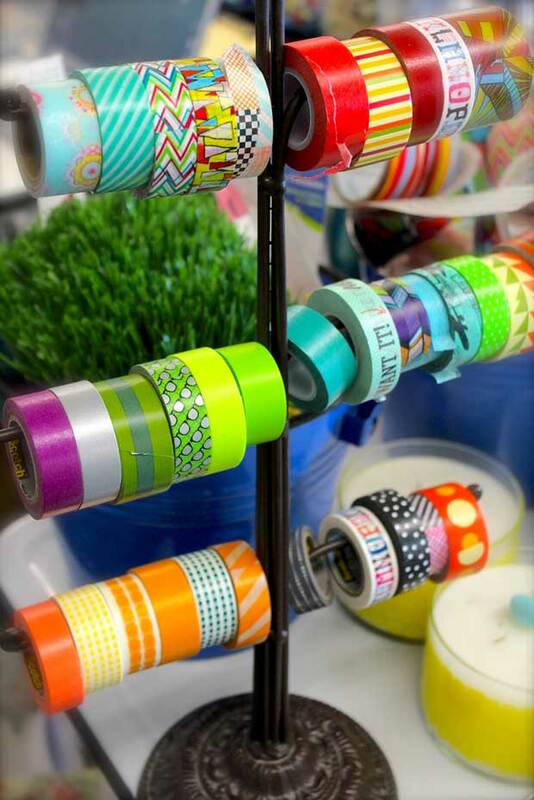 Our favorite by far is the new Happy Camper Ducktape that recently hit the arts and craft stores! 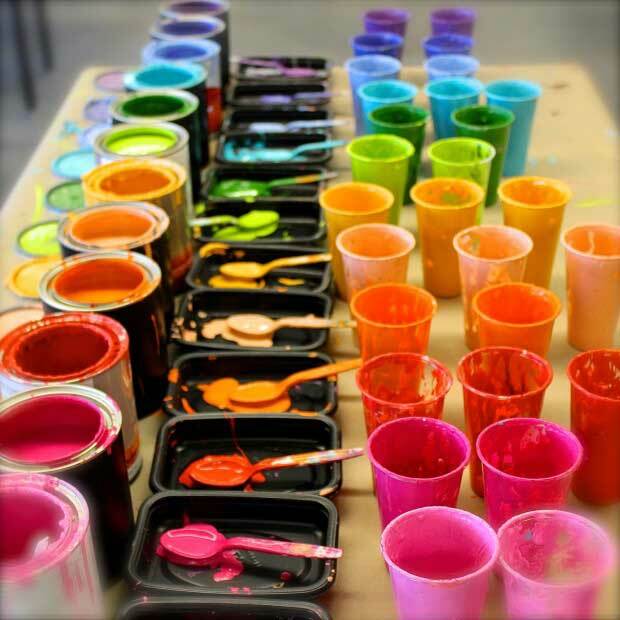 There are so many possibilities and purposes using tapes, that it really is a must in every art studio! Although we have art supplies throughout the studio, we often gather and arrange supplies in a grouping that we’ll be using for a particular project for easy access. Often we use our centralized tables for these groupings. In the studio we have one large white wall that can easily be interchanged for display. 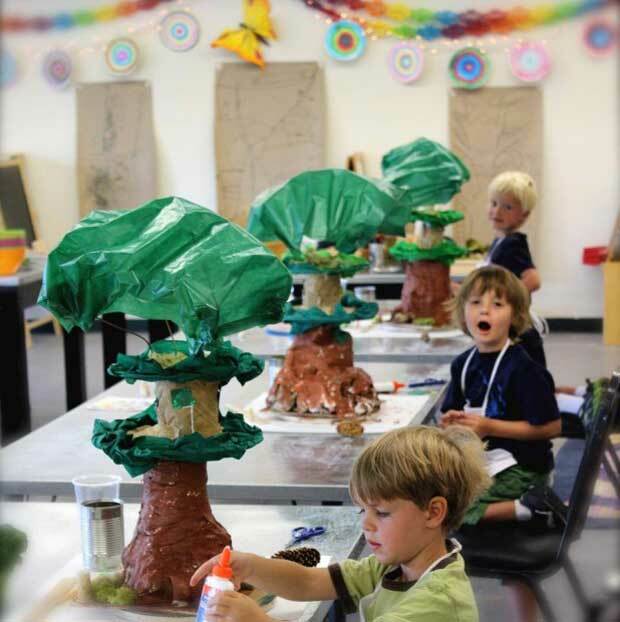 Here you can see large sketches for our 3-D treehouse sculptures in progress. This was actually the very first HANDMAKERY summer workshop we ever hosted, it was so much fun creating larger-than-life tree houses with a group of all boys! Baskets can also work as great storage solutions, but we’ve found that it’s not always easy to locate the same size and color down-the-road. Baskets are also not transparent, so jars are ultimately our favorite storage solution for smaller supplies, but baskets can always mix in well. Really, we just can’t get enough jars and we love that they’re affordable and don’t need to be labeled! 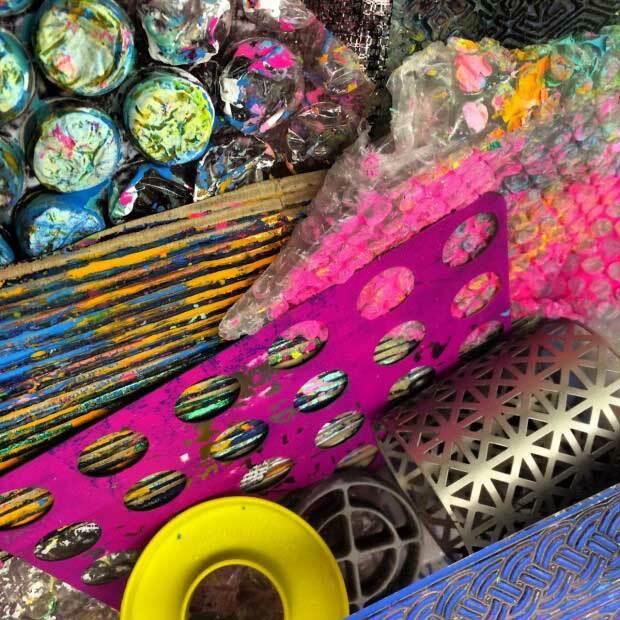 Here is a peek at a few of our favorite texture and printing tools, our collection is quite extensive! We love nothing more than thrifting for treasures. Most of the supplies we gather are not actually art supplies, many are household goods that were once used in the kitchen. We like nothing more than getting out treasure hunting to thrift stores, secondhand shops and garage sales; it’s beyond thrilling as you never know what you’ll discover that day! This was taken in the studio when we had 118 youth creating a 62 foot mural. Think this might one of our favorite photos captured in the studio! 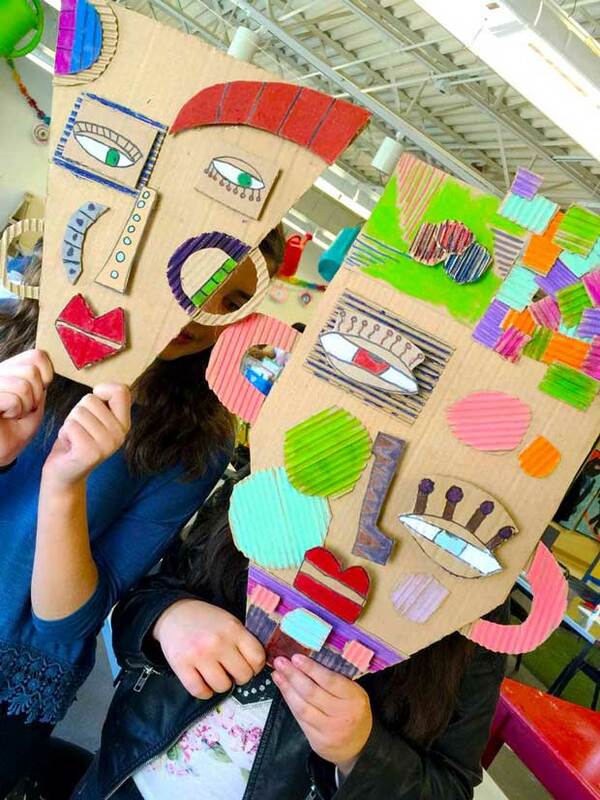 Here’s a peek at our Masks In The Making project with 5th-8th grade artists in the studio! Maybe you’ve seen this on our Pinterest boards? 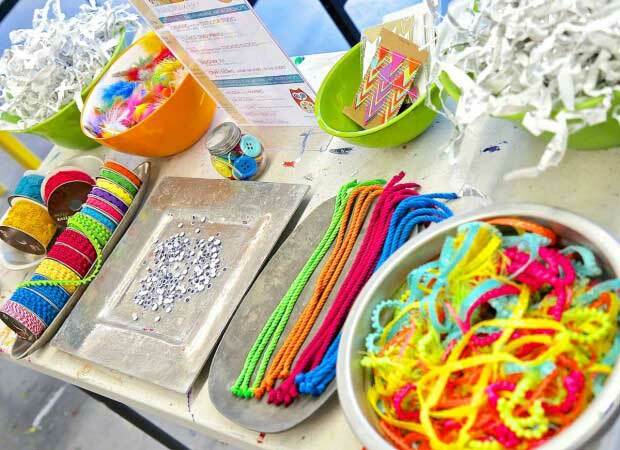 Interested in upcoming workshops, DIY projects, community creating, art with children? Be sure to follow us on Instagram and Pinterest to stay in-the-know! We’d love for you to join in on our newsletter and Facebook page! 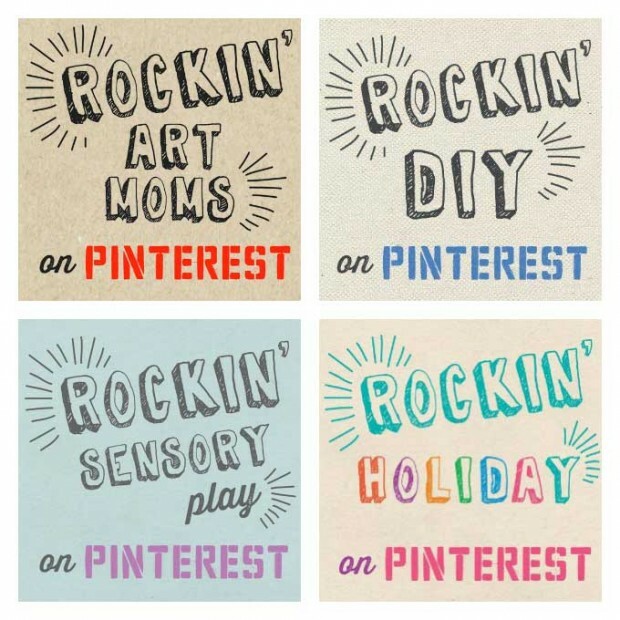 Visit some of our favorite Rockin Art Moms’ creative spaces and studios below! You can follow this highly creative group of RAMS on Pinterest and Facebook! 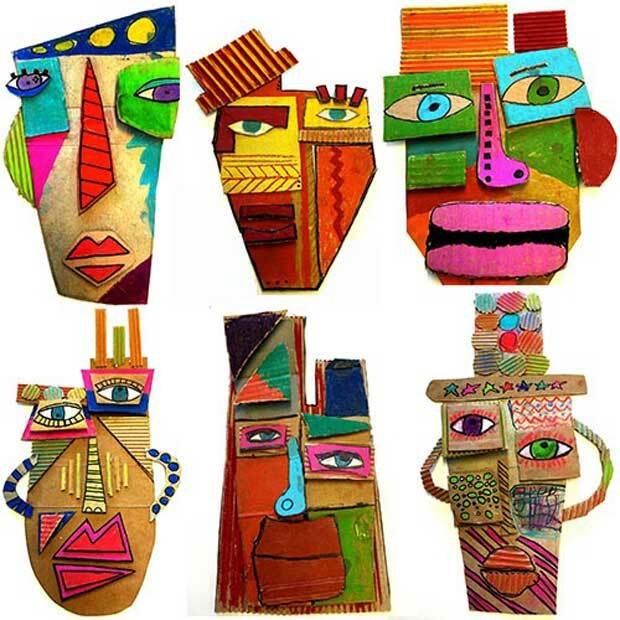 Please do check them out and say H-E-L-L-O, you’ll truly be amazed and inspired at the overflowing creativity for creating with children! Wow, your studio is so beautiful and inspiring! I love how you display everything using the color spectrum, it is so inviting and makes me want to jump in there and start creating. Hopefully some day I will see it in person! Hello Megan! So happy to saw this post today! We’d love for you to visit someday! Thank you for your sweet compliments on our studio! It means a lot coming from someone that plans + designs fabulous playrooms and kids’ creative spaces! Hope some of our readers travel over your way to see all the amazing things you do over at The Art Pantry!